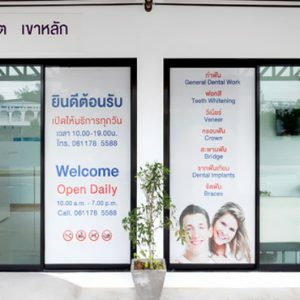 Following the opening of the Bangkok-Phuket Dental Clinic Khao Lak back in late 2015, Bangkok Hospital Phuket has landed on an uncharted territory, reaching out to local residents and tourists in Khao Lak areas, Phang Nga province. Now that the clinic has secured growing trust and been frequented by both Thais and foreigners, we find it hard to achieve a comprehensive range of dental work in a clinic environment, off the premises of its mother hospital, given more and more demanding dental work from clients each passing day. Therefore, it is with great regret that we are announcing the closure of the Bangkok-Phuket Dental Clinic Khao Lak, staring from 1 April 2017 onwards due to the number of technical and administrative reasons. Over this transition period, dental services at the clinic will be limited only to follow-up appointments by our orthodontist for those having ongoing braces work up until everything is completely done. In turn, all new dental cases from Khao Lak will be referred to the Bangkok-Phuket Dental Center at Bangkok Hospital Phuket, which is just 1 hour away from Khao Lak by car. Dr. Nayot Ponlasit, who has been based at the Bangkok-Phuket Dental Clinic Khao Lak since Day 1, will join forces with the Bangkok-Phuket Dental Center in Phuket as a full-time restorative dentist further on. Thank you very much for your kind understanding and continued support. Together we’re living a dream. Bangkok Hospital Phuket 2/1 Hongyok Utis Road, Muang District, Phuket, 83000, Thailand. Copyright 2017. International Dental Center in Phuket, Bangkok Hospital Phuket, All rights reserved.